Baby showers are really not my thing. Or gift showers, really. I find them really awkward, like participating in a public display of a private moment. There's usually an obscene amount of gifts, which is the first sign that something isn't right. Then there's the gift-opening, where everyone gathers in a circle and watches the honoured guest opens them one-by-one, doing her best to express sincere and equal gratitude after each. But I did have a number of baby shower offers, which I really do appreciate as a kind gesture. Instead, I thought it would be nicer to have an afternoon make-party in my apartment with 4 of my closest crafty pals and a few snacks. 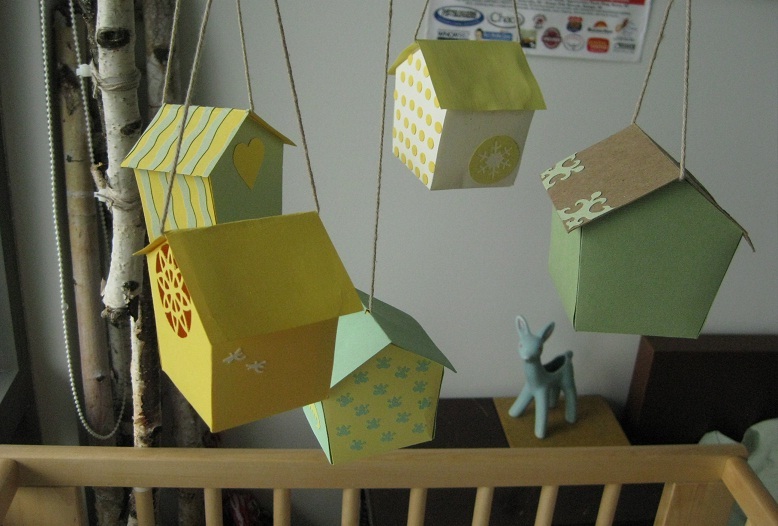 The project was a Paper Bird House baby mobile, an idea inspired by a visit to Copenhagen last year. Within Copenhagen, there is a famous bohemian and artsy squatter's community called Christiania. We spent a couple of days and nights in the area, and I distinctly remember a large tree covered with a hundred tiny and colourful wooden bird houses. To make the small houses, we used an on-line template, which I printed out slightly larger on legal-sized paper. The template was cut out, and traced onto card stock. Various paper punches and free-hand shapes were glued on or cut out, and the card stock was scored lightly at fold lines to be bent and glued into shape. Each of my pals ended up making 2 houses each, resulting in 10 little lemony-mint coloured bird houses, each one more unique than the next. Found birch branches formed the frame, with 5 houses dangling at different lengths from scrap yarn on each mobile. It is truly one of the sweetest baby gifts ever... I wouldn't trade it for a mountain of store-bought presents. Thank you, ladies!